For those of you who like to rewind the music clock back to the 1980’s, this night is for you! Roger and Gary are a super fun and congenial duo that bring a great 80’s setlist and will do their best to take your requests! Get ready for a fun and spirited night! Jim Counter, a Nashville veteran, is more than just country. How about Pop, Rock, The Beatles, Motown and R & B? 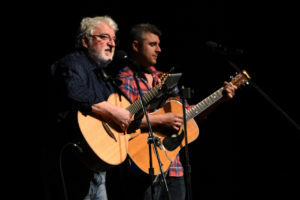 Counter’s repertoire includes the likes of James Taylor, Green Day, U2, Cold Play, Bob Seger, Marvin Gaye, Metallica, Gordon Lightfoot, Guns n’ Roses, Steely Dan and The Doobie Brothers, mixed in with some timely originals. Counter has a smooth and warm delivery both vocally and acoustically that can only be developed by years of performing live. Matthew Schroeder is a seasoned performer, guitar educator, and WAMI (Wisconsin Area Music Industry) winning guitarist who has a depth in his playing resulting from a life long pursuit of music and the guitar. Don’t miss this impressive performer! Plus enjoy our fabulous Fresh Perch Friday Fish Fry! Riley Haupt and Anniversary Party! We love this guy so it seemed appropriate to have Riley here to help us celebrate our Five Year Anniversary! Coming armed with a song list to pass around, YOU can choose the music! Yeah, Riley will get you on your feet and bring the “happy” to our party and your weekend.